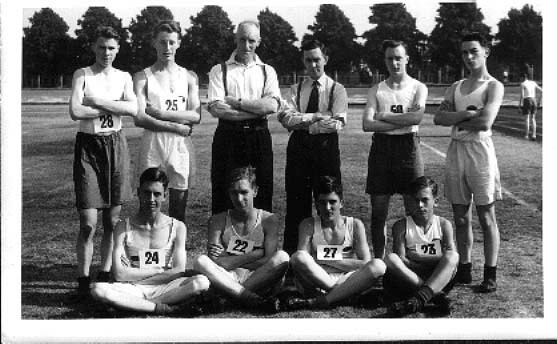 Athletics in the town before Basingstoke A.C.
Back row left to right, Reg Eade, David Guyatt, Wilf Stocker (coach), Flight Lieutenant George Holloway (OC 443 Squadron A.T.C ), Cliff Bloom, Gerald (Chick) White. Front row sitting, Charlie Tunstall, Peter Stocker, Graham Guyatt and Malcolm Downham. Despite no official athletic club active in the town post WW2, there were various athletic events promoted locally. These were associated with factory sports days, borough events and organisations, who put on these events in the summer, one of which was the popular Old Basing Horticultural and Sports Show at the Recreation Ground. Prior to the reformation of the athletic Club, I was competing in some of these atheltic events as a member of the Air Training Corps. I and other A.T.C members became involved in the team organised by the late Wilf Stocker. He coached us and occasionally he would enter us into local and some away events. In the photo are some of the A.T.C athletic team, who on this occasion were competing in an open track and field event promoted by Reading A.C, at Palmer Park. in August 1947. A young handsome bunch of teenagers, but we were not only a team, but vehement rivals ! Apart from Fl. Lt. Holloway, all those in the photo joined the reformed Basingstoke A.C in July the following year. Wilf Stocker was to eventually become the General Secretary of the club until his death in 1967. Our current Chairman Ian Byett, took over the role of secretary after Wilf’s death and remained in that post for over 20 years. I joined the committee c1955 and I am the only one in the group to have remained a club member. Sadly Wilf’s son Peter died suddenly at just 36 in 1968, but he had already left the club and the town with his family due to his work location. There were more of course, some of whom I managed to locate and invite to the club’s Golden Jubilee Year Gala Dinner, in September 1998. I introduced them all to the Gala Dinner Party and I tried to remember their favoured athletic disciplines they competed in all those years ago, with some success. Malcolm Downham too, met an untimely death, but he had enjoyed a footballing career with Basingstoke Town F.C. Later he moved to Calne in Wiltshire and eventually became the town Mayor. He met all the members of the club’s then race walking team, at the annual Chippenham to Calne 6 mile road race along the A4. It was a tradition in that race for the Mayor of Chippenham to start the race in the High Street and the Mayor of Calne would greet each walker on the ‘ Green ‘ at the finish. That day Malcolm recognised me and Joe Wrey and that was c1977. I was saddened later to hear that he had died suddenly. I still occasionally meet David Guyatt and Cliff Bloom, who live locally, Dave’s twin brother Graham I don’t see at all, as he left the town too. Dave informs me he is keeping well. Charlie Tunstall and Chick White I have lost contact with some time after I returned from service with the R.A.F in 1954. This look back down memory lane was just a recall of a few local athletes from those who competed unattached as we say, in events around the town before athletic club was reformed and a some brief memories of post reformation. After 59 years with Basingstoke A.C, I have a long memory lane to travel down, sad to say I wished I’d retained my early days diaries, but some how they’ve got lost. However, I’ll savour some of those occasional trips down memory lane I can recall.